Heat oven to 400°F. Spray large cookie sheet with CRISCO® Original No-Stick Cooking Spray. Unroll pizza crust dough on cookie sheet; press dough into 13x9-inch rectangle. Pinch edges of dough to form rim. Generously prick hot dogs with fork to prevent curling; cut diagonally into 1/4-inch slices (about 9 to 10 slices per hot dog). Place slices on dough; press down gently. 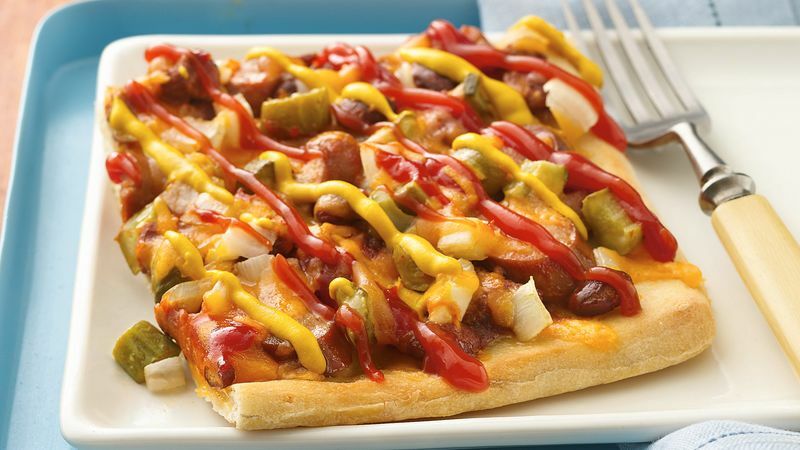 Mix oil and garlic; drizzle over dough and hot dogs. Bake 15 to 18 minutes or until crust is golden brown. Meanwhile, in 1-quart saucepan, heat chili over medium-low heat 4 to 5 minutes, stirring occasionally, until hot. Spoon chili randomly over hot dog slices; spread evenly to cover. Sprinkle with onion, pickles and cheese. Bake 2 to 3 minutes longer or until cheese is melted. Drizzle ketchup and mustard in diagonal pattern over pizza.